Quote: " Give God What is Right not What is Left"
* This is my 2nd year term as president of the WCLC-CYF president. Presently working in ETELECARE International as a Techincal Support Representative. 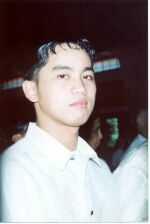 Computer Engineering graduate of Pamantasan ng Lungsod ng Maynila, the youngest of 4 children.